Choosing a toy for your puppy is a strategic process during their early stages. This is the time that good decisions when picking out toys will count the most. It’s incredibly important that you’re prepared for the teething stage. Below, we’ve compiled a list of some of the best toys for puppies and thrown in some advice for good measure. Check it out! Puppies (and all other dogs) have an innate instinct to chew on things. However, since the puppy stage is also the teething stage, the instinct becomes much more prevalent. Since chewing is basically inevitable, it’s good to view it as a chance to teach good behavioral skills as well. Chewing helps relieve anxiety and stress (yes, as cute as puppies are, they are usually under a lot of stress). Chewing also helps channel energy that they would normally be using to wreak havoc. It even helps develop jaw muscles. The teething process lasts quite a while, and the chewing process lasts a lifetime; that being said, it’s important to invest in chew toys that are going to last a while. So it’s important to understand what toys are going to help with the teething process and not harm your puppy in the meantime. When it comes to buying chew toys there are several things to consider: material, shape, quality, etc. So, why are these things important? Well, let’s start with material. Understanding what material to use will solve the majority of your issues. I prefer to look for rubber or cotton in the form of knots. Rubber is basically indestructible as far as puppies are concerned. It will last for years. It’s also soft enough that it’s also cushy. Knotted cotton gives a very similar feel to rubber, at least when you puppy bites into it. They are both good for keeping the teeth and gums healthy as well. Shape is important because you want something that your dog will be able to grip easily. If the chew toy is too large, they won’t be able to get their teeth around it, and they can end up straining their jaw. Plus, it just won’t be very comfortable for them. I try to look for something that is in a similar shape as a bone. This way your puppy will have no problems fitting their mouth around it, and it will also have varying sizes. When we talk about quality, it is very much in line with what the chew toy is made out of. For instance, toys that are made out of a thick rubber are much more expensive than toys that are made out of latex, plush or vinyl. However, the rubber toy might last you seven years, while the plush toy might last seven days. Over the life of your dog, you will spend much more money if you continually choose chew toys that are inexpensive. I’m not saying that you can’t find chew toys for less money, but the better quality toys are usually much more expensive. Regardless, it’s important to always give him appropriate options when it comes to toys. Make sure he knows that he has a toy that is just for him and encourage him to use it. If not, they might choose to use your favorite book as a chew toy! Certain toys can pose a safety risk to your puppy as she chews. If a toy is too small it can be a choking hazard, and toys that are ripped apart too easily can create dangerous internal blockages. Especially for larger breeds, a puppy’s toy needs to be strong enough to survive playtime. As popular as tennis balls are, they don’t make a very good toy for a teething puppy. Even small dogs can tear off the yellow fuzz around the outside, and bigger dogs are able to rip the whole thing up. Tennis balls just aren’t durable enough to stand up to your pup. A bone can also make a dangerous toy for a puppy. Many bones, especially those that have been cooked, are liable to splinter. Bone fragments can slice up your dog’s already sore gums and get caught in her stomach or intestines. It’s best to just avoid giving puppy leftover bones altogether and stick to toys that have been designed to be dog safe. One of the main reasons we give our puppies chew toys is so that they won’t destroy our possessions. There’s no getting around the fact that dogs need to chew, and chew toys help to prevent your pooch from ripping up the sofa cushions. If you buy your puppy toys that resemble household objects though, such as shoes or a remote control, she may get confused between her toy and the real thing. Stick to chew toys that your puppy can easily recognize and distinguish. You want to keep your puppy safe while she has fun, and buying a toy that is large and robust enough for your dog is important. A flimsy or inappropriate toy could result in an expensive trip to the vet. This is a great toy that was made just for puppies that are going through the teething stage. It’s specifically designed for puppies who are teething, and it has a ton of benefits that will help them through the process. It comes with raised bristles that helps clean the teeth and prevents build-up; this helps keep your puppy from getting an infection. The great thing about this chew toy is it really doesn’t have many limits to the amount of chewing power it can withstand from a puppy. It’s important to remember this toy is designed for a puppy going through the teething stage. Once your puppy has grown and has adult teeth, you will need to upgrade them to a chew toy made for adult dogs. As you’ll notice on here, I always recommend Kong toys. I just think they are some of the best and most durable toys available. The really fun thing about most of the Kong toys is that you can usually fill them with some sort of treat. I usually fill mine with peanut butter and our pup absolutely loves it. Every time I do it, it keeps her occupied for hours. Also, because of that feature, it really helps with separation anxiety and other behavior conditioning. Puppies are prone to separation anxiety, and if it isn’t broken while they are young, they can have it their entire lives. 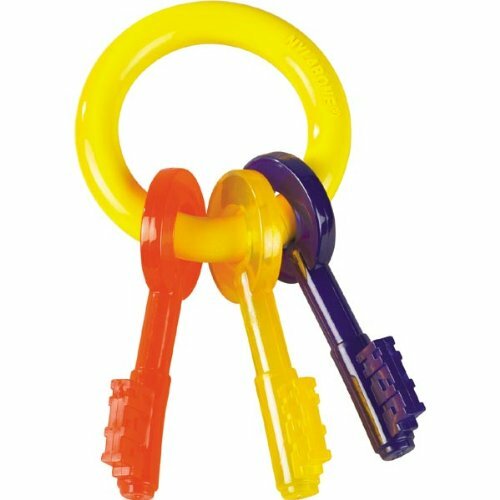 This is an excellent toy that will last for several years even after your puppy isn’t a puppy anymore. I highly recommend this chew toy. This is a large rope that will be great for your puppy, and it will continue to be great throughout their life. It comes in different sizes, but each size should still be large enough to play tug-a-war with your puppy if you like. However, make sure you’re playing responsible so your puppy doesn’t get hurt during the process. This toy also helps the dog floss while you’re playing. This helps keep their teeth and gums healthy. Also, it’s machine-washable so you don’t have to worry about it becoming too disgusting and losing its appeal. You can simply toss it in the washer. I figured we’d end on a good note. 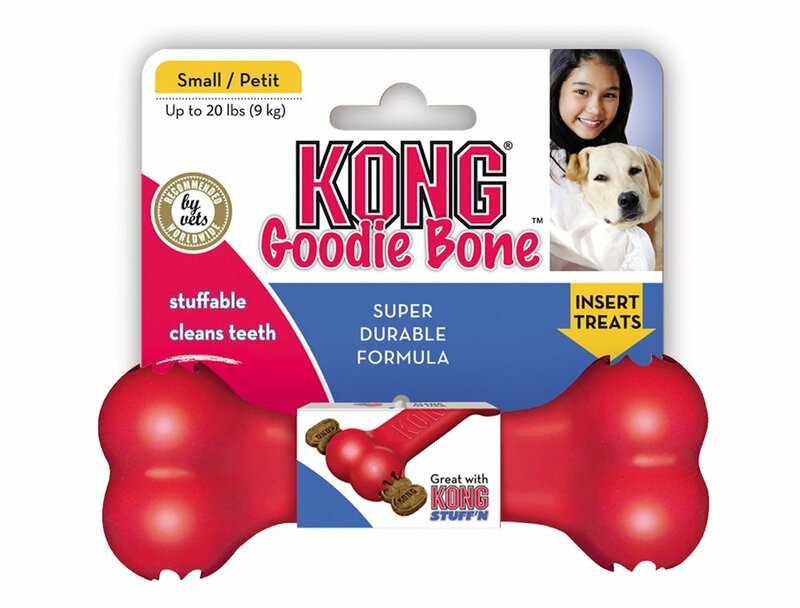 This is the Goodie Bone by Kong. They call it the Goodie Bone because you can stick treats in the edges of the bone to make it more appealing for your puppy. It will help keep your puppy occupied for hours while you’re away. It’s also another strong, non-toxic, durable, American-made, rubber toy by Kong that will last you several years even after your puppy isn’t a puppy anymore. It’s a great choice for a chew toy, and I love recommending it to people! This rope dog toy was designed specifically with your pup’s dental health in mind. The rope fibers act like floss against your dog’s teeth as she chews, keeping her mouth clean and providing some relief to her itching gums. The Dogit rope even has a slight minty smell to keep your pup’s breath fresh. Rope toys are great for playing with sociable puppies. 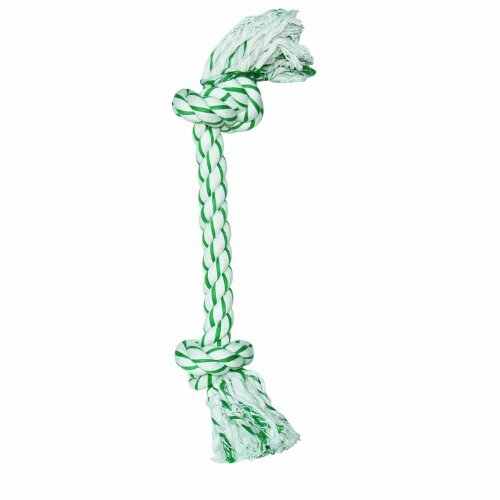 The rope is lightweight enough for a small dog to carry around, and is ideal for games like fetch. You can also give your pup a good work out with a game of tug-of-war. The Dogit rope bone may not be able to hold up to powerful chewers. Rope is easy to shred for dogs with large teeth and can be a mess to clean up. The minty smell may also put off more sensitive puppies. This bone is able to withstand the jaws of large puppies and powerful chewers. It is made of tough nylon and is highly textured to make it more appealing. The texture also helps your puppy to maintain good dental health while she plays. This bone comes in a variety of sizes, from petite for small puppies to giant for larger breeds. It may be too tough for young puppies. The DuraChew will keep even the most enthusiastic chewer entertained for hours at a time. You should always watch your dog when she plays with nylon toys like this, because they are liable to splinter and can be dangerous. Always switch out your dog’s toy when it starts to show signs of wear. Kong brand toys are renowned for being tough, and are even used to train police K9 units. 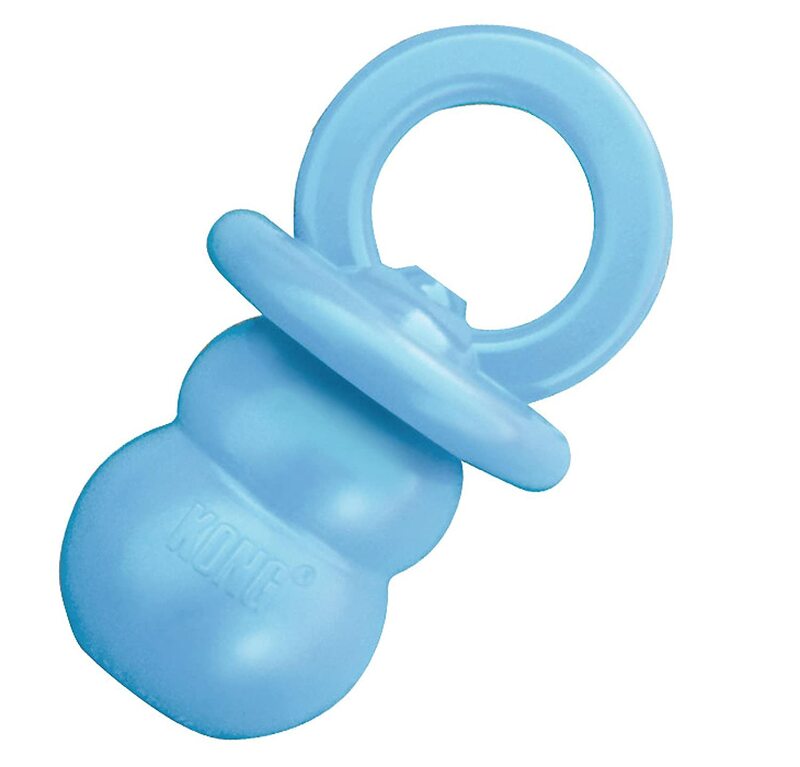 This binkie toy will be able to stand up to even the most enthusiastic chewer. The rubber, while strong, is also flexible enough for your puppy to get a good grip around and has lumps and grooves for added texture. There is also a special compartment that can be stuffed with treats. Your puppy will be entertained and challenged for hours as she tries to dig the treats out, while the pressure from chewing the rubber will soothe her sore gums.